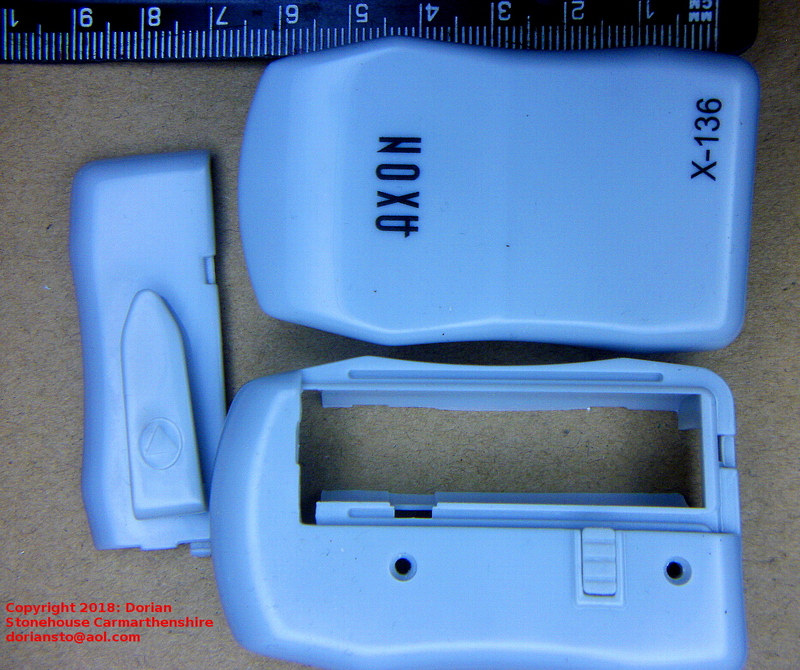 Axon X – 136, Hearing Aid. 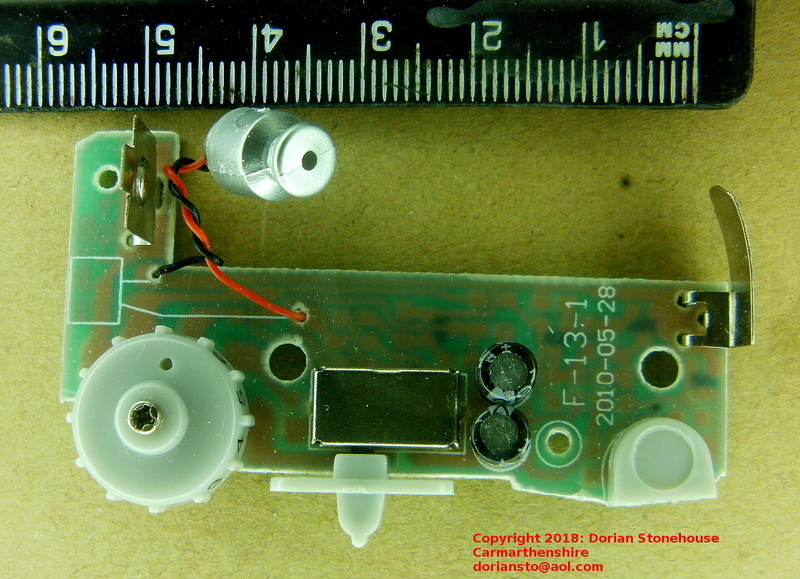 “Pocket wired mini- receiver. “Elderly deafness ear care tool”… Worth it OR Worthless? “Hearing enhancers” have been around for many years. 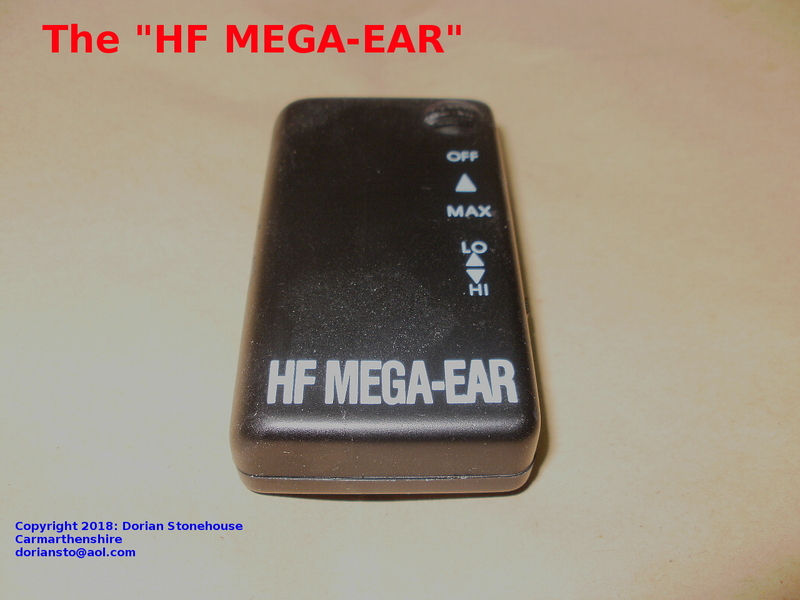 They include the “Mega ear” (shown directly below) and other exotic-sounding devices, aimed at “improving” now and again, the hearing of those who may find it a tad difficult listening to the telly or radio. 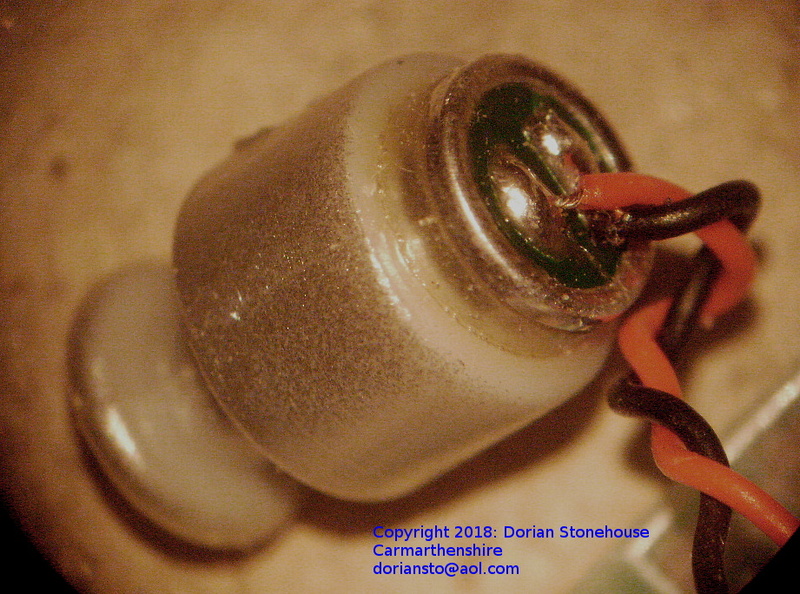 Typically, all these “hearing Aids” employ 4 or more transistors, which give a gain of around 50dB. With the development of integrated circuits, it is now possible to squeeze a lot more circuitry inside less box; thereby allowing manufacturers to make all sorts of way-out claims, extolling the virtues of these devices! 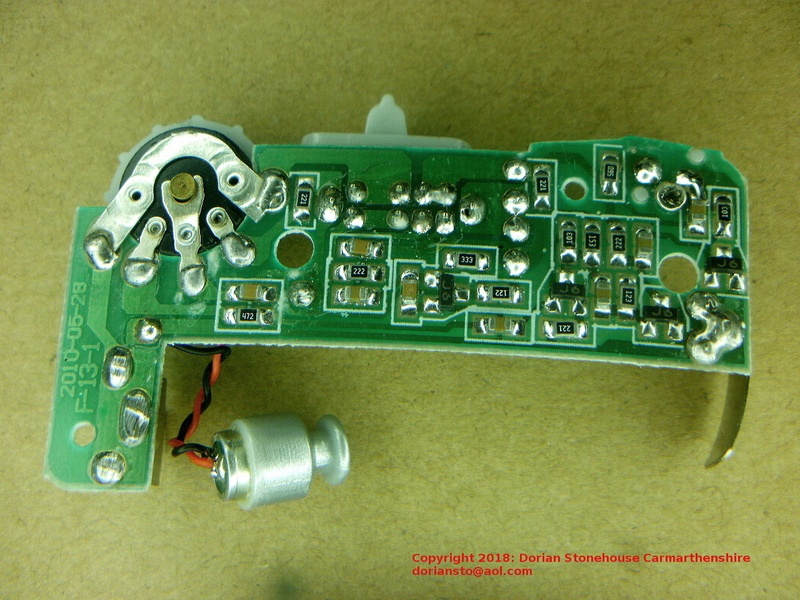 The amplifier unit comes with a simple earpiece, which must be inserted well into the ear to prevent undesirable feedback – whistling; while the amplifer runs on 1 x AA battery (battery is not included). 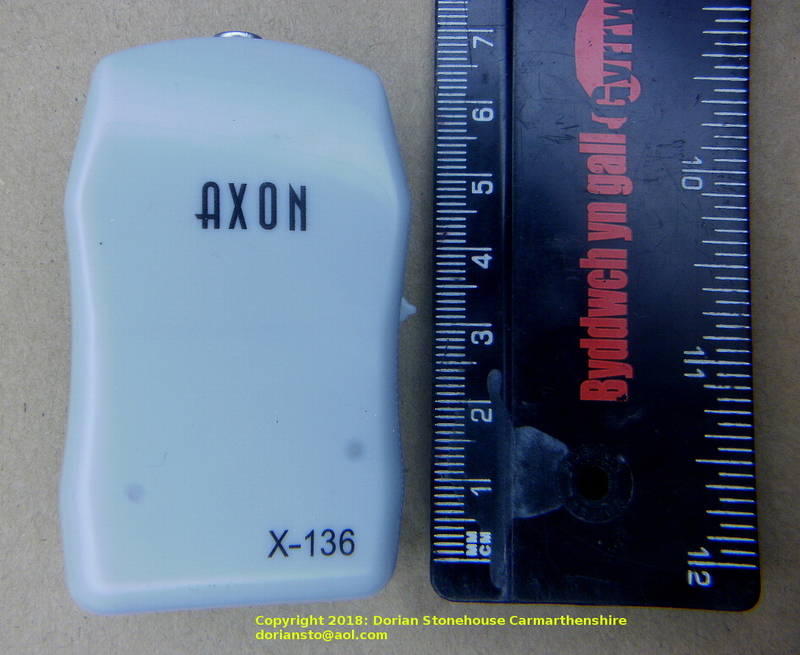 Axon X – 136, Hearing Aid. 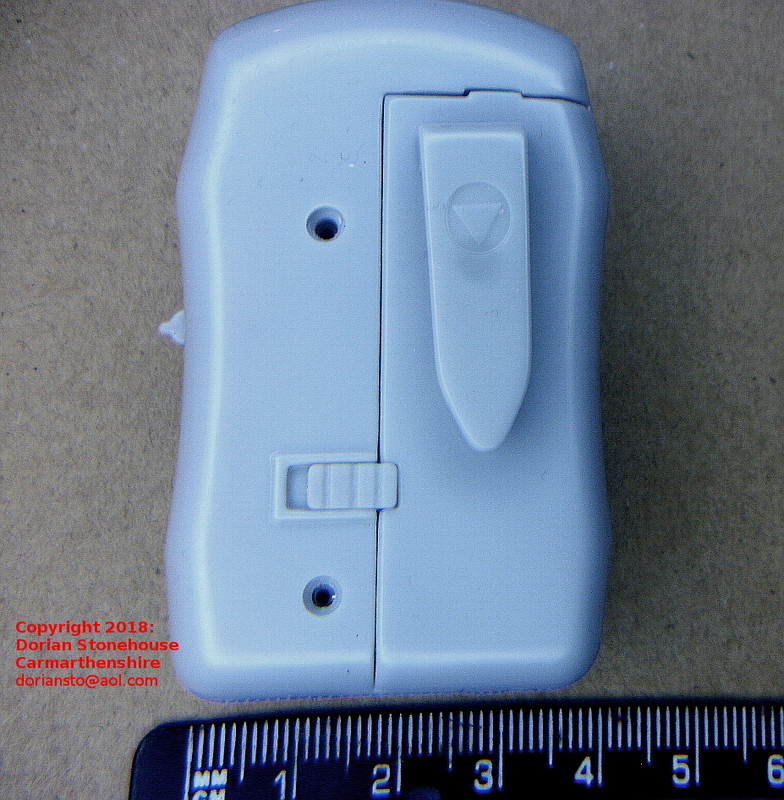 “Pocket wired mini- receiver. 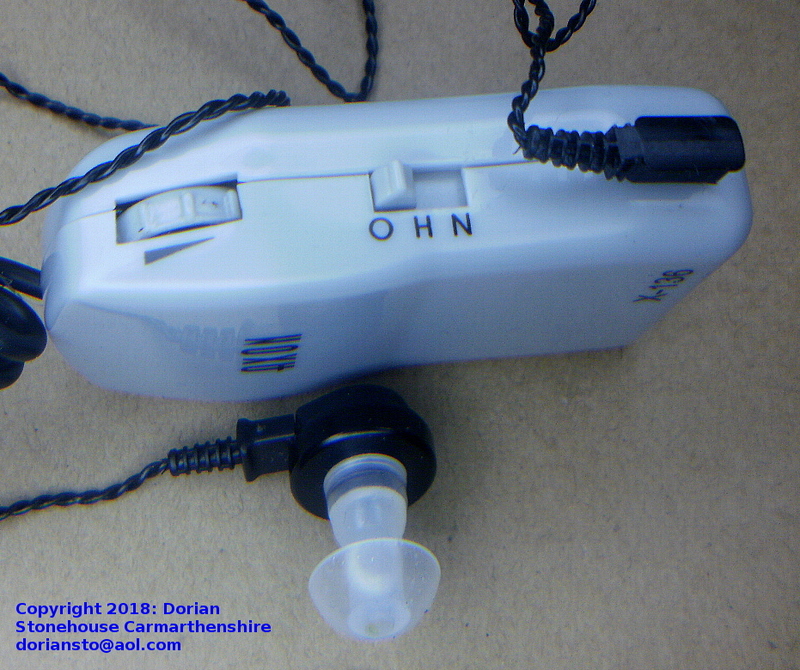 The “elderly deafness ear care tool”… Worth it OR Worthless? 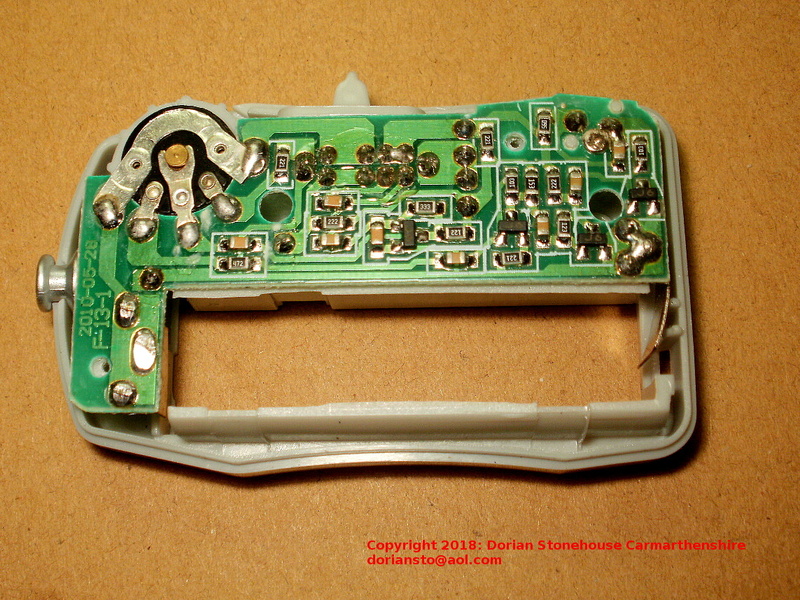 Sandwiched between the top and bottom halves of the case is a front-facing Electret microphone capsule. and signal to noise issues (hiss) at higher gain conditions. There is nothing remarkable about this circuit. However, it is very sensitive and care should be taken when switching on to avoid high dB sound levels from damaging your ears! 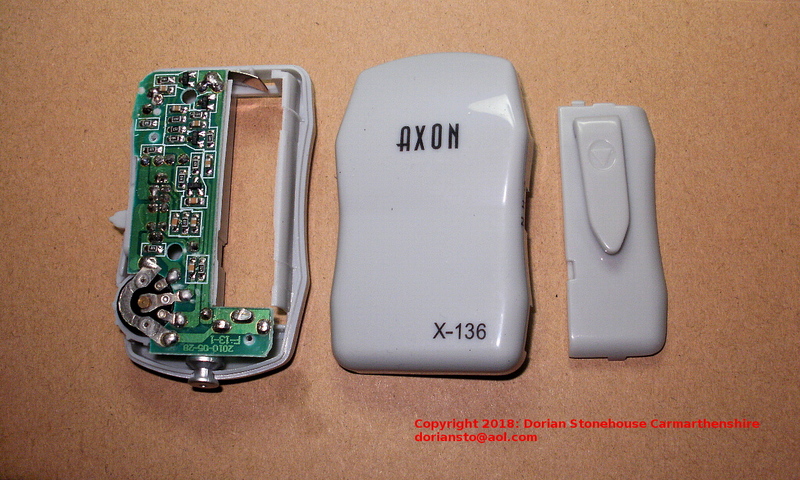 Does the Axon X – 136 and similar “Hearing Aids” work? This depends on where you intend using it. For example, in a room with one sound source, it works very well in boosting tv or radio sound output. So it is okay in a quiet room on a one-to-one person basis. In noisy places such as restaurants or pubs, where there is a hubbub of people talking, music playing, mechanical sounds emerging from machines, clattering cutlery etc – forget it! These non-targeted sounds will totally crowd out targeted sounds. Furthermore, every slight movement of the microphone will produce a terrible cacophony which will drive you bonkers! It might work okay in the cinema. But make sure you are not sitting too close to somebody eating crisps, as you will hear every crunch! Does this mean that the tiny electret microphone that comes with these units is useless? 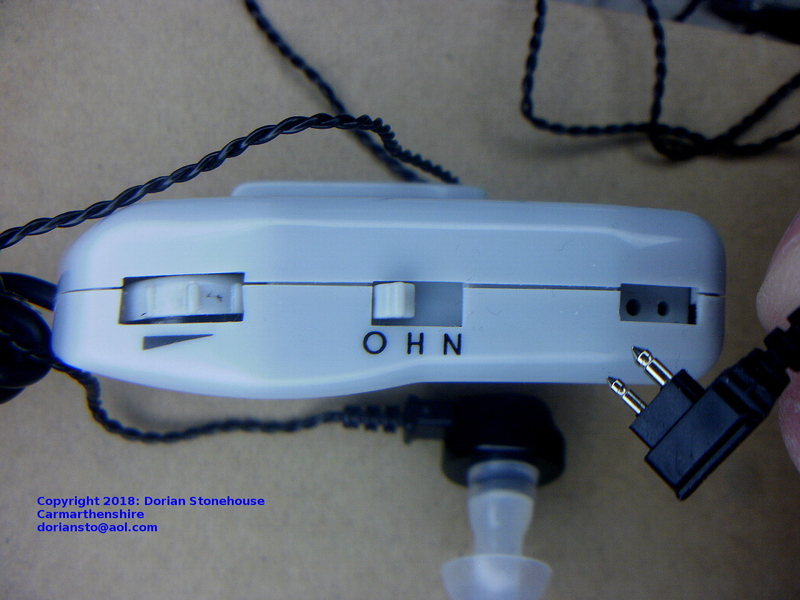 The short answer to the above question is “yes” microphone number 2 (above) picks up sounds from all directions. Therefore, in a noisy environment it is totally useless! A great improvement may be had by using microphone number 2 or 3, which are high gain directional microphones and are known as ” Supercardioid ” microphones. 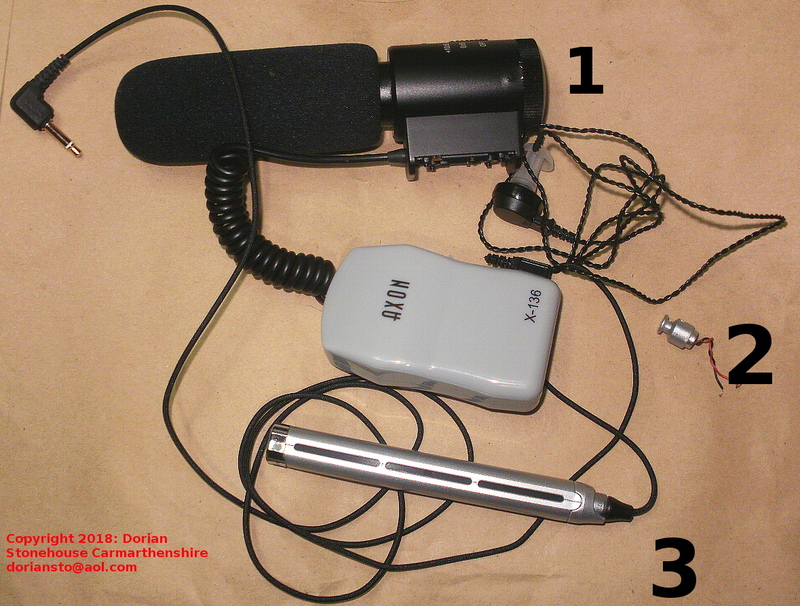 Note that microphone number 1 has a windscreen to reduce sibilance and plosive Sounds. These microphones will do a better job in targeting wanted sounds. But do not expect perfection, as even this type of mic lacks a pencil thin Polar Pattern; so will let in some unwanted sounds. As these “hearing Aids” are obviously not tailored specifically for the individual user, your purchase can be hit-or-miss depending whether the “hearing aid’s” audio spectral response suits you. For this reason, they will only be suitable for those with very mild hearing impairment, wishing for a modicum of success in picking up individual sounds. In any case, make sure that as part of your purchase, you get a good quality external directional microphone thrown in. I hope this short article has been of assistance to you. If you would like more information on the subject covered above, please drop me a line and I will do my best to answer you.